As literature lovers interested in contemporary writing from Africa, it’s already hard enough keeping up with all the exciting content coming out every month in English. What of the francophone scene? Here is a selection of news items you may have missed recently. Eva Natacha Fanou is the winner of the 2015 Plumes Dorées prize for her short story ‘La Tranchée’ (the trench). She is the first woman to receive this prize, which is awarded every year to a Beninois writer. As part of Plumes Dorées, a short story anthology is being published, bearing the name of the winning story ‘La Tranchée’. It will also include the 9 shortlisted stories by Yves Biaou, Annette Bonou, Mylène Flicka, Mireille Gandebagni, Michel Henri Hlihe, Fiacre Kakpo, Jordy Hounhoui, Jovencio Kpehounsi, and Djamile Mama Gao. Next year’s prize will be awarded to a novelist. 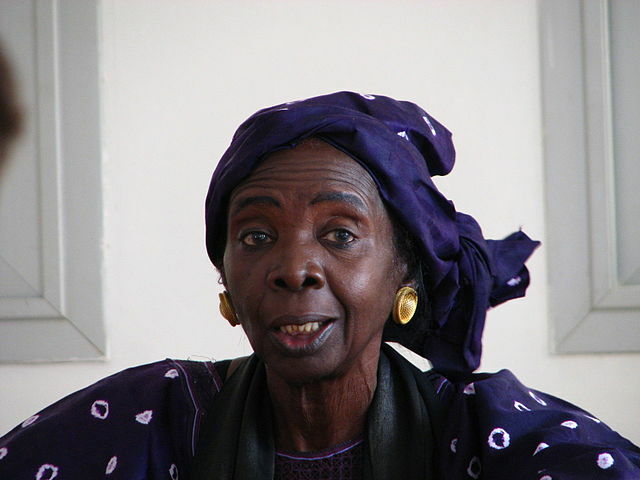 In June 2015, Aminata Sow Fall received the Grand Prix de la Francophonie for her literary work in French. With 10 novels to her name, the Senegalese author is no newcomer to the literary world. Her most famous novel “La grève des battu” (1979) was translated into English by Dorothy S. Blair as “The beggars’ strike”. On 24th October, UNESCO will host the 3rd edition of francophone manuscript day (#JDMF2015), during which hundreds of new writers will have their books published for free. 30 shortlisted manuscripts will be distributed commercially in partner bookshops. Manuscript submissions are open until 30th September. “Aminata Sow Fall” by may! from New York City – IMG_1159. Licensed under CC BY 2.0 via Commons. Growing up a monolingual reader, I was obviously exposed to a lot of dubbed films and books in translation. At some point, I was such a fan of Dostoevsky and Chekhov that I pledged to learn Russian so that I would one day be able to read the original text. That didn’t happen and up to this day I still read Russian authors in translation. I do read other languages though, including Swahili. A glance at my makeshift bookshelf got me wondering: which Swahili authors would I have access to if I had to read them in French as my 12-year-old self would? The short answer is: few, very few of them. And when I speak of access, it is in a very loose sense of “the text existing in a language I can read”, without taking into account the price barrier, the availability of the book at a library, or the possibility of ordering it. Out of the books listed below, only one can be purchased in ebook format (Kindle), which means that readers outside Europe and north America will have to pay dearly for shipping or wait for a friend to bring it in their suitcase. The Swahili > French language pair is rare enough to make any new translation an event. To be fair, French is not doing too badly in this department, maybe because Swahili is taught at university level and has been made an examinable language for the Foreign Service entrance examination. For someone who’s interested in Swahili literature, there is really no shortcut: go learn the language! Euphrase Kezilahabi, “Nagona” (1990) and “Mzingile” (1991) translated by Xavier Garnier as “Nagona suivi de Mzingile” (2010). It worth noting that this family saga was initially written in Kerewe, though the author had to resort to undertaking a Swahili translation on his own in order to find a publisher. Bwana Myombekere na Bibi Bugonoka, Ntulanalwo na Bulihwali was completed in 1945 but it was published for the first time in 1981 in Swahili translation. Robert Shaaban, “Maisha yangu” (1960) translated by François Devenne as “Autobiographie d’un écrivain swahili, Tanzanie” (2010). Alain Ricard. La publication de la littérature africaine en traduction. IFAS Working Paper Series / Les Cahiers de l’ IFAS, 2005, 6, p. 58-62. Xavier Garnier. “Traduire le swahili en français. À propos de Nagona et Mzingile d’Euphrase Kezilahabi“, Études littéraires africaines, n° 34, 2012, p. 19-27. Saraba’s latest issue is a special feature exploring literary festivals through the eyes of writers Magunga Willams, Tolu Daniel, Ciku Kimeria, Nyana Kakoma and Julie Muriuki. Each contributor reflects on the festivals they have attended and the impact these events have had on their writing life. To get a vicarious taste of Ake Festival, Storymoja Festival, Writivism and Hargeisa International Book Fair, you can download the magazine here. Valentine’s Day multilingual anthology by Ankara Press: a real treat! I generally don’t celebrate Valentine’s Day but an anthology released yesterday by Ankara Press gave me a reason to change my ways. Being the literature fan that I am, I was overjoyed to hear of seven African writers putting together short stories about love on Valentine’s day. I already knew of Ankara Press for their daring romance collection, so this sounded very much within their scope but the supreme treat for me was that each story was translated into a langage other than English spoken by the author. Títí tí wọn fi jẹun tán, ó sá n rẹrìín, ó sì n f’ojú nlá rẹ tó dúdú mininjọ sọrọ, bíi pé inú rẹ n dùn fún nkan àsírí ìkọkọ kan tó lárinrin. Each story is available online in audio format as well. I highly recommend Edwige Renée-Dro’s French reading of Solitaire : her characters’voices just don’t sound the same in my head as they do when the dialogues are read out loud. Out of the seven translations, I could only read Kiswahili, Yoruba and French but I hope many other readers will be able to appreciate the stories in Hausa, Igbo, Kpelle and Nigerian Pidgin translation. To add a dot under e, s, and o: ALT + letter (eg ALT + o to type ọ). Tone marks are inserted after the letter. You can download the keyboard layout here. All you need to do is to drop it into Library > Keyboard Layouts and select it in your language & text preference window. Let me know what you think! I hope you’ll have as much fun typing as I did designing this keyboard layout. It’s also worth mentioning that Tom Gewecke made a combined layout that allows one to type both Yoruba and Hausa on the same keyboard. More on his blog! If you want to know what someone thinks about Africa, ask them about African languages. You’ll find that the word “dialect” comes up a lot more than you would have imagined. Why the stubbornness to refuse to use the term language ? The person you’re talking to believes that across Africa, people speak varieties of the same language (presumably African?). They don’t know what a dialect is but you certainly can’t compare their superior language to those ‘dialects’, can you? They use dialect in a derogatory way, if you will. Let’s be honest. When you live in south-east Asia, French people don’t come and ask you whether you’ve condescended to learn any of the local ‘dialects’. They admire you for putting in the effort to grind through hours of repeating tones and learning the Thai alphabet. I don’t think the various people I’ve talked to on this topic consciously look down on African cultures but they certainly have internalized a degree of contempt. I don’t blame them for it. Which languages people speak in Africa is probably something they have never given serious thought to. To be fair, there’s also the widespread perception that all African languages have very few speakers and are therefore negligible. A man I spoke with was shocked to hear that there are several languages he had never heard of, that were spoken by millions of people on the African continent. In any case, a small European language (in terms of number of speakers) is still regarded as a full-blown language, so why make it a dialect when it happens to be spoken in Africa?